1. If SWTOR is released, the hype will be bigger than George Lucas announcing Barack Obama as Lando Calrissian in the long-denied Star Wars Episode 7. Ok, maybe not but you get what I mean. Aside from the gaming world, the wider media will pick up on the new MMO phenomenon. There will also be plenty of “Warning – your child / spouse / sibling will enter SWTOR and never come out” stories from those looking for the ‘MMOs are evil’ angle. 2. If SWTOR isn’t released during 2010, at least a dozen SWTOR forum regulars will experience spontaneous head explosions. I’m a regular SWTOR forums reader and more infrequent poster. Like any large forum community it has plenty of people passionate about the topic of communal interest. There’s a small handful that are so passionate that I worry about their craniums if SWTOR doesn’t launch during 2010. I do of course mean a brain explosion in the metaphorical sense, though if someone actually has their head explode with frustration then this prediction becomes even more impressive. 3. BioWare will generate plenty of lore inconsistencies. This isn’t a criticism at all, just a fact. A project of this scope that’s staking its life on immersive storytelling is going to create some real lore challenges. Not so much within SWTOR itself, but when compared to the enormous amount of information already out there from Star Wars movies, novels, comics, TV shows and graphic novels to name five. 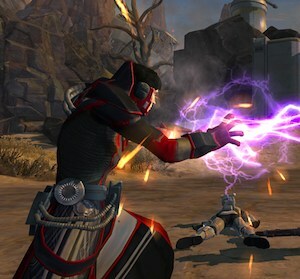 The SIth Lord ‘Power of Two’ concept is one tiny example debated nicely in this thread on the SWTOR forums. Multiply that by a few thousand and there’ll be plenty of lore debate for years to come. 4. The first two weeks after launch will be a frustrating mess. This too isn’t a criticism as such. No matter how well BioWare plan, they won’t be able to cope with the load of the users they’ll attract. There’ll be widespread wait times, performance issues and related fun. I’ll also throw in here the server issue: if Oceanic servers aren’t there from the get-go, which I don’t think they will be, there’ll be some significant backlash from non-US and non-European players. 5. There will be no Sith Janitor or Jedi Podiatrist classes. There are a bunch of other really obvious predictions and then the more daring ones that those more educated than I will make. Over to you: what are the obvious SWTOR developments for the coming year? What are the longer stretches of logic you’d stake your reputation on?